The Epson Stylus Photo 1400 is a high-resolution large-size photo printer able to produce large-quality prints in a number of sizes and across many media types. Like many of Epson's inkjets, it has many potential issues with ink consumption and long-term maintenance, but as a short-term solution for photo printing it may be a viable solution. The printer measures 24.2" by 12.4" by 8.8" with all trays closed (what Epson describes as "Storage") and 24.2" by 31.6" by 16.3" with all trays and doors extended (what Epson describes as "Printing" and the printer's dimensions, unavoidably, when in use) and weighs 25.4 lbs, heavier than the printers in Epson's all-in-one NX series but still reasonably light if it will be regularly necessary to move the printer. It should fit comfortably alongside other computing or printing equipment on a desk or another work surface. The Photo 1400 has a maximum printing resolution of 5760 dpi by 1440 dpi, consistent with Epson's other high-resolution inkjet printers, and prints up to 15 pages per minute in either color or black and white. This rating changes for photos: the printer can produce 4" by 6" prints in 46 seconds, 8" by 10" borderless photos in 1 minutes, 51 seconds, and 11" by 14" borderless photos in 2 minutes, 53 seconds. The Photo 1400 supports printing to a number of paper sizes. It will print to 4" by 6", 5" by 7", 8" by 10", A4, letter, legal, 11" by 14", 12" by 12", B, A3, and Super B formats, as well as user-defined sizes up to 13" by 44". It will also print borderlessly across all of those formats other than legal and A3. The Photo 1400 also prints to CDs/DVDs and No. 10 envelopes. The Photo 1400's wide printing sets it apart from other consumer inkjets and makes the printer significantly more desirable for those who need to regularly make larger-sized prints. Its ink is rated as being smudgeproof, waterproof and fade resistant up to 98 years under glass or up to 200 years stored in an album. The Photo 1400 includes a USB 2.0 port and a PictBridge port, allowing you to connect the printer directly to a digital camera, eliminating the inconvenience involved in connecting a camera to a computer, then sending a job to a printer. The Photo 1400 has a maximum input capacity of 120 sheets plain paper or 20 sheets photo paper. While this is likely adequate for personal use, home networks with high paper throughputs and office environments likely will need at least one more printer to meet their needs. 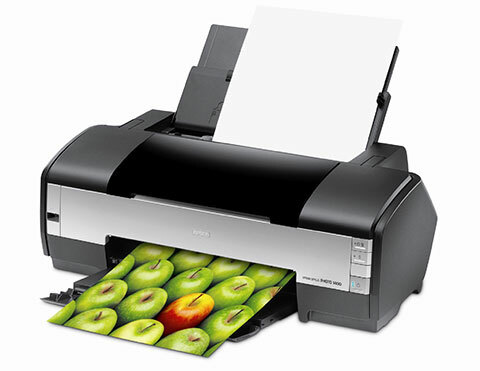 The Photo 1400 does not include any memory card readers like other Epson inkjet printers. While the presence of a PictBridge port may make this irrelevant, both are offered by many units, and regular memory card users will likely be more satisfied with another product. The Photo 1400 does not offer any networking support built into the printer, nor is a network adapter available as an add-on from Epson. This makes it necessary to purchase either a third-party print server or share the printer via home networking in order to connect it to a network. If this is too much an inconvenience, look into the many other Epson models with integrated wired and wireless networking solutions. 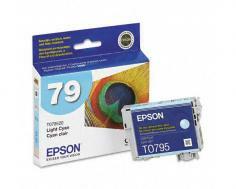 As is consistent with Epson printers, many users complain about the printer's ink reporting, as the printer will often claim that its cartridges are empty when users insist they are over halfway full and that the printer will sometimes not recognize official cartridges following resets. Furthermore, the printer shuts down when one of the many ink cartridges is empty, necessitating a constant supply of cartridges on hand in order to ensure that jobs can be finished. Review it: "Epson Stylus Photo 1400 "
The Photo 1400 consumes high-capacity cartridges for Black, Cyan, Magenta, Yellow, Light Cyan, and Light Magenta available at high-capacity ratings. The high-capacity black cartridge is rated at approximately 470 pages, while all color cartridges are rated at yields of approximately 810 pages.